Fourth times the... whatever. 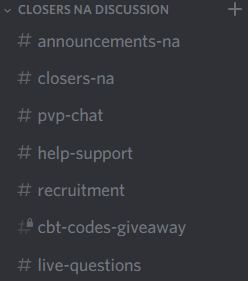 Fourth giveaway of Closers NA CBT Codes! Copypasta. Congratulations to those who won! Sorry for those of you who didn't. Sorry that these are coming much less frequently as of lately- supply of Buddy Codes have finally started to run low, and I'm also struck with personal events that keep me busy. Part 5 of the Giveaway(which I REALLY hope to do at one point) won't be anytime soon unless if I get another generous donation/supply of Buddy codes or Founder packs, so do keep it in mind. Onto the fourth part of the giveaway. It will be the same format as the others, and again, it will be from the draw of 1 to 1111. This time, it will be dedicated to J. 4. In that channel, post any kind of picture for J- regardless of screenshot, fanart, official illustration, etc. Do NOT post a NSFW art! Winners will be picked whenever I find the time, which is hopefully by this weekend. So you've got an extended amount of time to participate. Also, when I'm feeling the mood, I also sometimes do sneaky limited time secret giveaways on the Discord as well. So keep your eyes peeled on that #announcements-na channel!